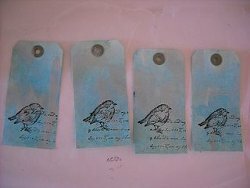 Make these Hand Dyed Bird Tags with Paper Gift Bags as a charming way to wrap up presents. 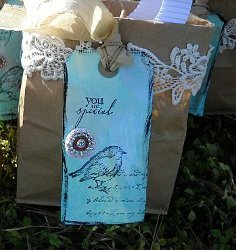 Melony Bradley has created this wonderful tutorial on homemade gift tags using your own dyed paper and some stamps. Put your creativity to the test with this sweet project. 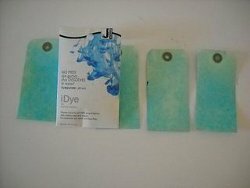 Jacquard Products Idye comes in machine washable friendly packets but can be dissolved in hot water and used for other surfaces such as paper. I like to mix everything up in a gallon sized baggie that can be zipped up and stays fairly mess free. 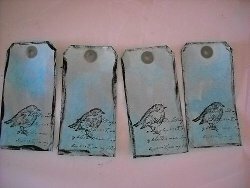 I dipped the tags into the mixture and let them dry on paper towels for a few minutes. Once dry, I dry brushed them with Jacquard's Lumiere in Metallic Silver to give them extra sheen. 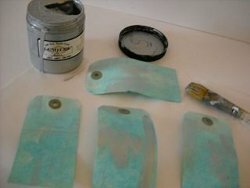 Adding paint to the tags also makes them more durable. 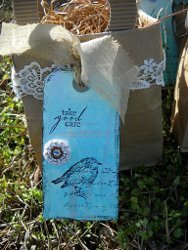 I used StazOn inks and two of my favorites, this script font stamp and my little bird to stamp toward the bottom of the tags. Dry brushing some Neopaque paint around the edges of the tags added adds a finishing touch. I added my tags to plain lunch sacks with the tops rolled down cuff-style. I added some lace trim and a little sparkly embellishment to the tag. Handles were created using paper punches and fluted paper from Canvas Corp. 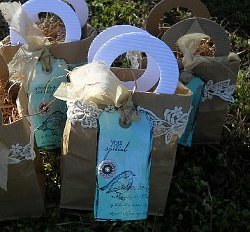 Stuffed with shredded kraft paper, these bags will make fun and fast Easter treat bags.